Fells Point is one of Baltimore’s most historic areas. 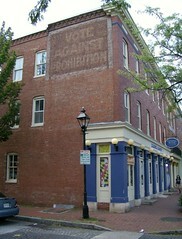 Here, a “Vote Against Prohibition” advertisement has lasted long past the demise of Prohibition. Perhaps not coincidentally the Fells Point area is known for bars and nightly rowdiness. Baltimore’s Inner Harbor is the perfect example of how history and travel intersect in wonderful ways. Formerly the Inner Harbor was mainly for shipping, but over the past several decades Baltimore has turned this into a convention and tourism hot spot for the entire coast. One of the most appealing features in Baltimore are the Water Taxis which take you from place to place all day for $9, offering a cheap tour. Be sure to ask the pilots about the buildings and harbor history – most are very well informed. This entry was posted in advertising, tourism, travel and tagged Baltimore, fells point, Inner Harbor, maryland, prohibition. Bookmark the permalink. Charleston, SC has a building with an exterior advertisement for a millinery shop. Well, the ladies hat shop is long gone… but the advertisement remains as part of the strong historical preservation ordinance. Often such touches of authenticity are quite valuable for tourism purposes. The use of the neighborhood may have changed but its visual aspects and overall “charm” are economically critical. Preservation is not solely the province of weirdos; the Chamber of Commerce often leads the preservationists. Great points as usual FoolsGold. I think history is fun, educational…. and a neat tourism economic force.